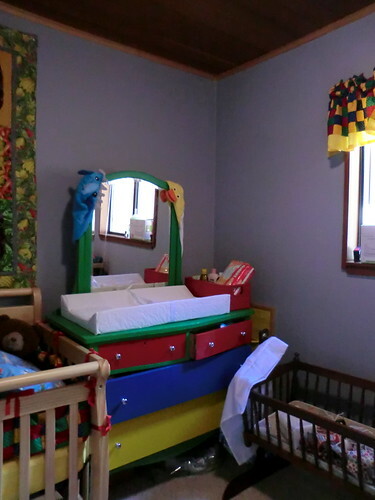 A few updated photos of the baby's room, now that we have all of our baby shower gifts unpacked and put away. Sorry they are fairly poor quality. The bassinet is not still in the baby's room, it is right next to my bed all ready for baby to be near us. And there is no more junk on the windowsill. The quilt that is covering the top of the bookcase was handmade by my principal...aren't the colors perfect? Also, the bumbo seat is now stored nicely in the closet, the stuffed animals are on top of the red shelf and I have some diaper and nursing supplies where the stuffed animals are in this picture. We are planning on making a changing pad cover with Lynne this weekend, it will match the bumper pads and curtains. 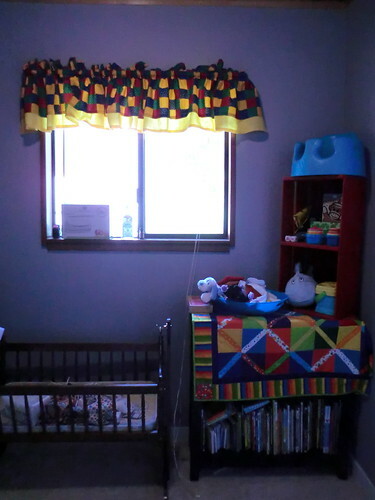 The bulletin board you see tucked next to dresser is hanging on the wall, ready for lots of baby pictures. And we have put a few hooks up on the wall for the laundry bags to hang on so they aren't just floating around. You like the bed full of all of the home birth supplies? I promise it won't actually be that full when Baby Bybee sleeps in there! 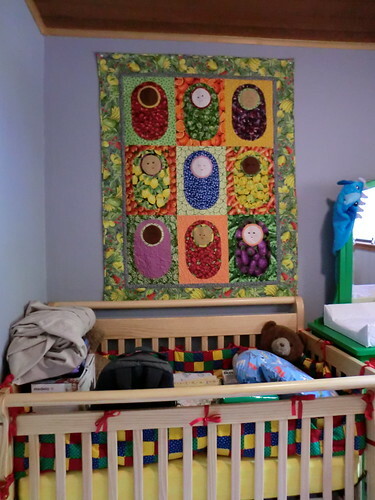 The quilt above the bed was handmade by one of the paraeducators that I work with, it's a baby babushka pattern and all of the material has different foods on it. I love it! 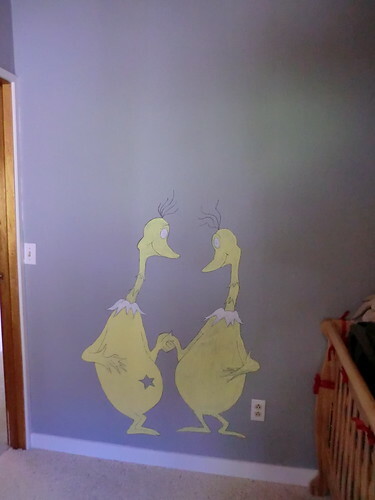 And we can't forget the sneetches. Both of whom are a darker shade of yellow and are getting closer to being completely done! I guess these pictures are already a little bit out of date, but we are pretty much done! Maybe I will take one last set of photos when the sneetches are done and when the changing pad cover is on, that way we have one finished set of pictures for posterity!